Also known as Blazing Stars, the Liatris Flowers are characterized as spike shaped purple/lavender florets growing on tall, lean stalks. Each bloom has fuzzy hair-like petals that open no more than 20%, maintaining this blossom's elongated shape. They are perfect for tall floral arrangements. The Liatris is a staggering and elegant bud. Globalrose.com produces year round in the best climate available in the world. All our products are grown in greenhouses, using the latest technology offered, so we can guarantee quality every single day. Your orders are shipped absolutely fresh, direct from the greenhouses to you via FedEx. 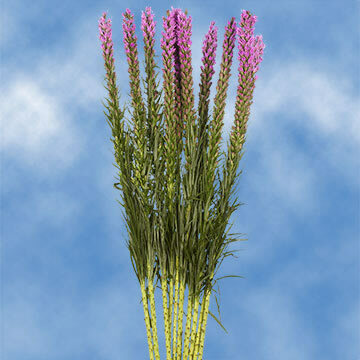 Globalrose sells Liatris Flowers at prices that are usually lower than most local wholesalers. All our products are cut specially for you, your loved one or special event (wedding, party, fundraising event, birthday or holiday), 3 days before they are delivered to your door.